New Mill puts you right in the heart of Dublin’s historical Liberties area. The district is packed with culture, nightlife and shopping. The world-famous drinking haven, Temple Bar, lies just a 15-minute walk from New Mill and is packed with cosy pubs, quaint cafes and tiny galleries, which line its cobbled, busker-strewn streets. On foot, you can get to the Dublin Institute of Technology in just 10 minutes, and Trinity College Dublin, Royal College of Surgeons, and Dublin Business School in 15 minutes. Studying at Dublin City University or University College Dublin? Hop on a bus from one of the nearby stops to get there in 40 minutes, or carpool with your friends for a 20-minute drive. With loads of choice when it comes to choosing what type of accommodation you need, New Mill has something for you. 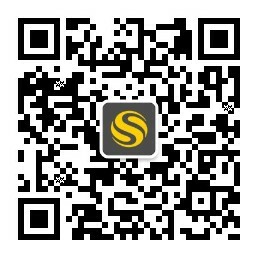 Want a social living situation? Sharing an apartment with other students doesn’t have to mean compromising on your privacy. 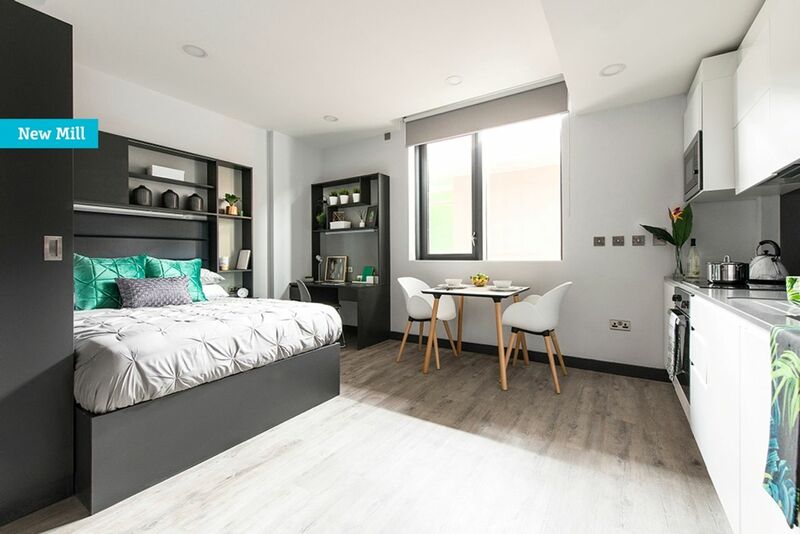 The shared cluster apartment means each student gets their own private room with a double bed, an en-suite and plenty of storage, and shares a kitchen and living areas with other students in their cluster. Prefer to have your own pad? 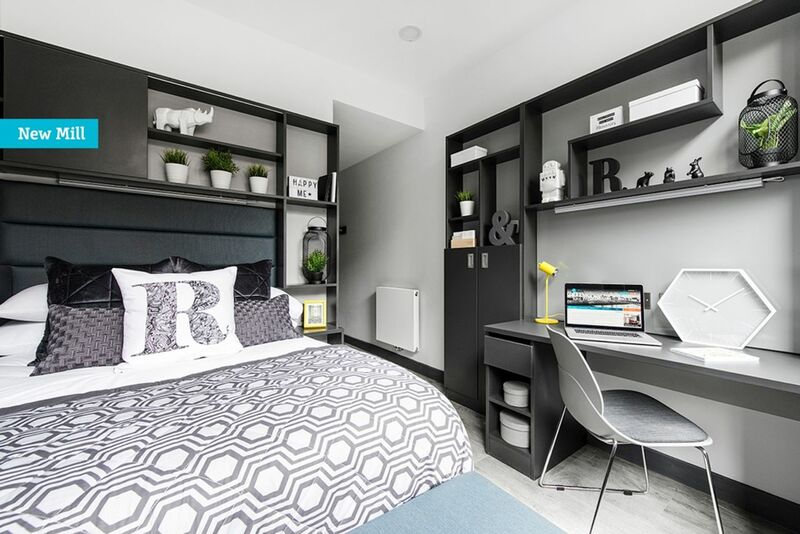 In studios, you’ll get your double bed and en-suite, as well as your own kitchen and dining area. These are perfect if you like having space to yourself, or if you’re a postgraduate student who needs to escape from distractions. 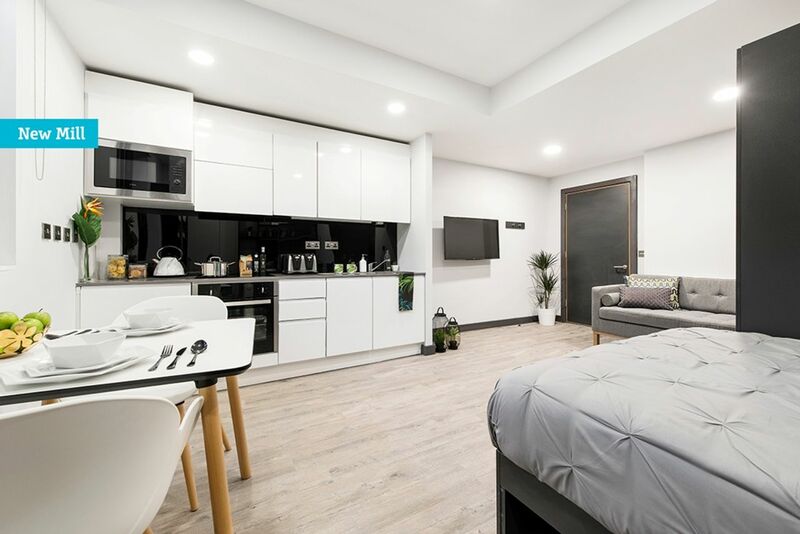 In addition to your fully furnished room, you’ll also get all utility bills included, high-speed broadband and WiFi, on-site laundry facilities and maintenance services. New Mill is a great place to live and love your time here as there are loads of amazing social spaces to enjoy. You’ll get big screens and the comfiest seats in Cinema Rooms. Courtyard is a perfect place to congregate! Hang out with friends, old and new. Have a blast playing air hockey, table tennis or a game of pool in common rooms! Wir haben leider keine Unterkunft gefunden, die deinen Wünschen entspricht.Alle Privatzimmer in New Mill ansehen.